Our grandchildren might live on the moon. If so, one likely place for a base would be the volcanic landscape of the Marius Hills. Or, more accurately, under it. Today’s APOD shows the region as imaged in the 60’s by the pre-Apollo Lunar Orbiters. There’s an image insert that show an interesting detail, an opening into an underground lava tube. The latest news: Japanese scientists have located sizable underground spaces. These are large enough to house large Earth cities. If explorers could solve the problem of water, these empty lava tubes have protection against the hazards of life off-planet: radiation, micro-meteroids, temperature extremes of vacuum. Arguments for Hadley and Marius Hills were fairly evenly matched, both from scientific and operational standpoints, and the debate between the two was virtually deadlocked until astronaut David Scott … said that he preferred Hadley although he thought he could land at either site. Scott’s opinion tipped the balance. 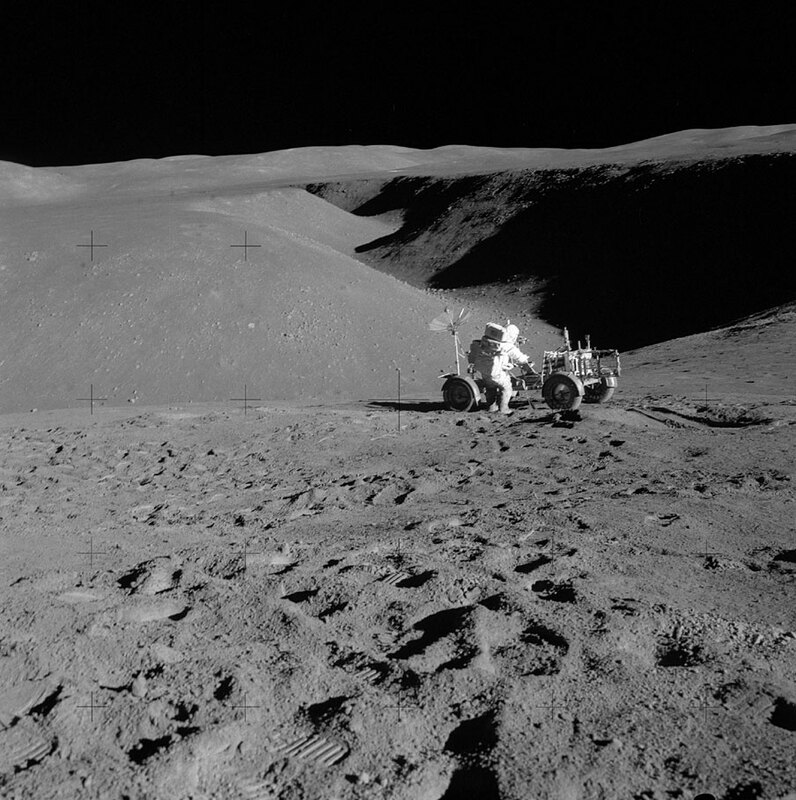 The Board recommended Hadley for a launch date between July and September 1971 … The choice of a site for Apollo 17 was left open; Marius Hills and Copernicus were the leading candidates, but others (e.g., Littrow) were still in the running, and a new site might be found in future orbital photography. Scott and his crew had a fabulous mission. 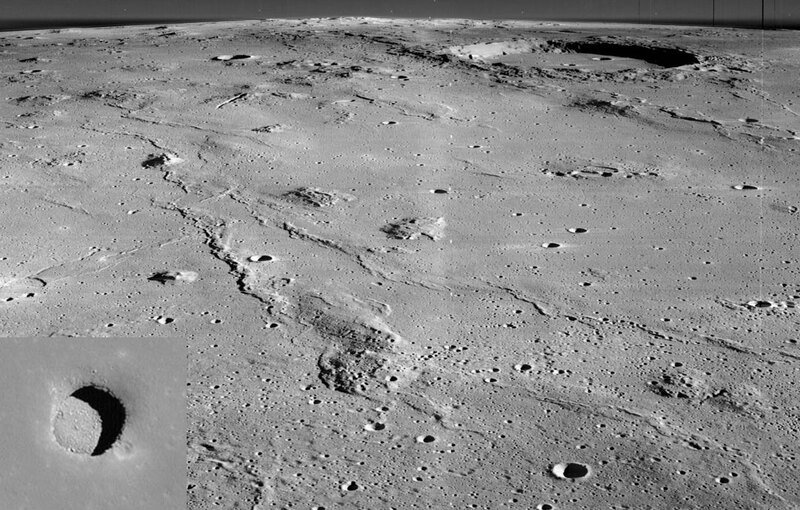 A landing approach over a mountain range to a fairly tight place between Hadley Rille and the mountainous terrain of the Lunar Apennines. Still, it would have been stunning if the astronauts had stumbled across that skylight opening (lower left inset, above) to caves below. Though they had the first lunar rover, they had no equipment that would allow them to drop a few hundred feet through one of the skylights. This is fairly well confirmed as a collapsed lava tube. Imagine the buried and covered version: many miles long, some hundreds of feet wide. A near-perfect set-up for settlers. This entry was posted in Astronomy and tagged Apollo 15, lunar lava tubes. Bookmark the permalink.